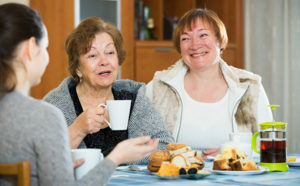 Learn Why Caregiver Socialization Is So Crucial to Your Health. Feeling Isolated? Learn Why Caregiver Socialization Is So Crucial to Your Health. Let’s be genuine: serving as a caregiver for a senior loved one can become tiring, stressful, and isolating. As care needs advance, particularly if a chronic disease like Alzheimer’s or Parkinson’s disease is at play, family caregivers may feel as if they’re in over their heads, and getting through the standard tasks of the daytime – taking a bath, cooking food, running errands – can seem like a barrier too big to leap. Nonetheless, we know that social isolation and loneliness are linked with serious health risks: heart disease, stroke, depression, and even a more significant prevalence of developing dementia or dying prematurely. Caregiver support is essential, both for the loved one being cared for and the family members delivering that care. Home Sweet Home In-Home Care, providers of expert Portage home health care services for seniors, is on hand to provide support in so many different ways, through hands-on help with all areas regarding elder care, preparing of food, keeping the home neat, running errands, and so much more – allowing family much-needed time to themselves to spend with good friends and in pleasant, relaxing activities – ensuring the wellbeing of all family members. Contact us at any time for the professional in-home care help you can trust, providing you the ability to establish a healthy life balance while knowing your senior loved one is in the very best hands.